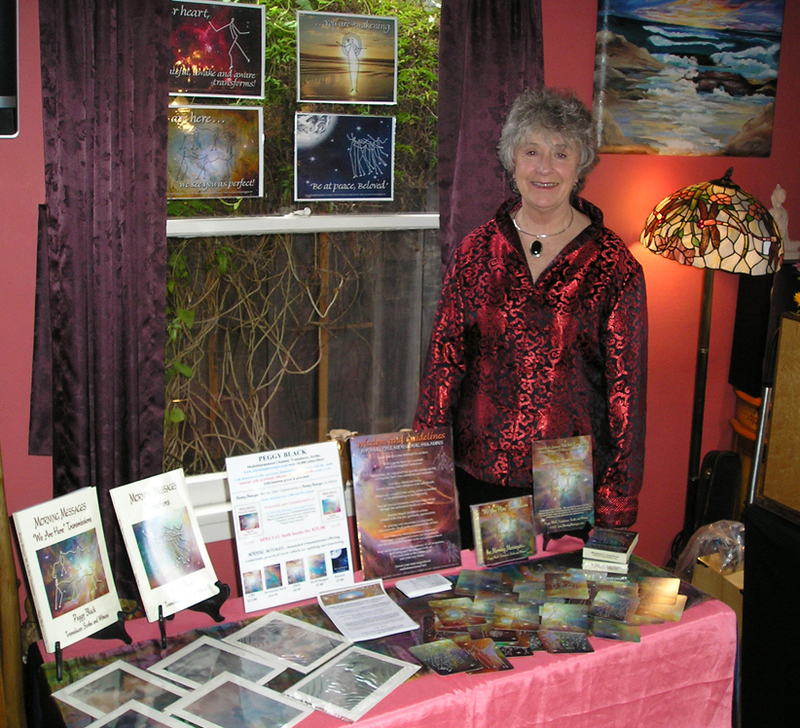 Peggy offers a variety of lectures and workshops: Miracles, Intentions and Manifestations; Allowing Prosperity; Sound Awareness; Sculpting Reality with Sound; The Power of Your Words and Intentions; The Metaphysics of Sales; Alchemy of Collage; The Creative You; Engaging Celestial Support; Partnership with the Divine; Inner Alchemy; Becoming a Conscious Alchemist. Peggy founded the International Sound Symposium. 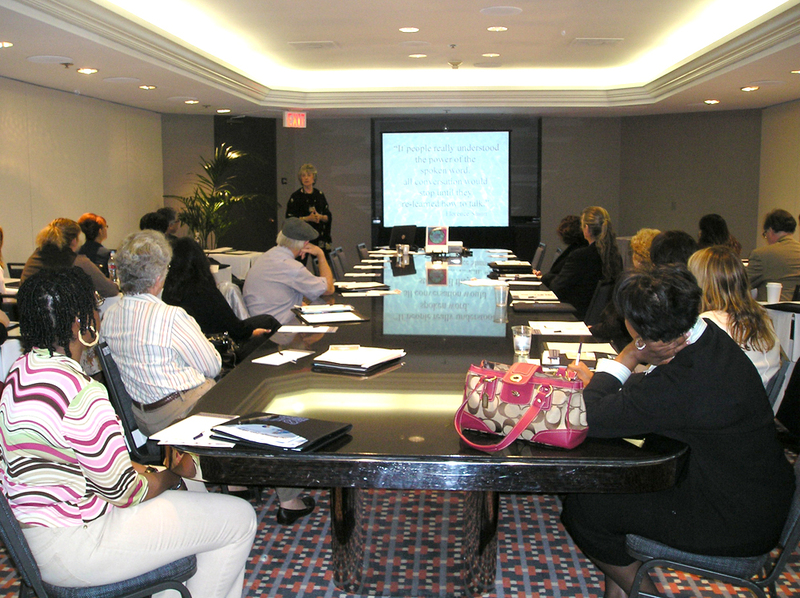 She conducted morning forums at Tom Kenyon’s Sound Healer’s Trainings. She was Ceremonialist for the sacred water ceremony, Ocean of Gratitude Cruise with Dr. Masaru Emoto. She was featured in People magazine as “Fabulous over Sixty.” Peggy presented at the 2011 World Congress of Illumination with Patricia Cota-Rhobles. She offered private channeled session on the Beyond Words cruise. She presented at The Gather the Women Conference as well as the Dream It Do It Conference. 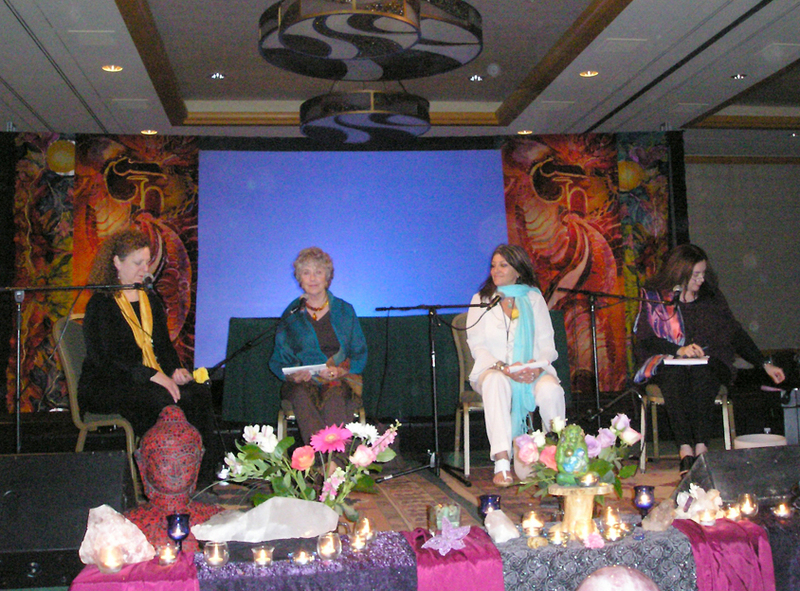 Peggy has presented at numerous conferences including Women of Vision and Action; Healing Our World; New England Sound Healing; World Sound Healing; Global Sound Conference; Globe Institute Psychoacoustics and Sound Healing; Advisory Board of the Healing Music Organization; Advisory Board of the Sound Healing Network and New England Sound Healing Research Institute; First International Vibrational Healing conference; Be Your Own Healer Conference; Kauai Center for Holistic Medicine and Research; Women’s Dream Quest. Peggy is a contributor to and has shared the monthly transmissions from the ‘team’ with “Spirit of Maat” web magazine for ten years. She is also a contributor for several other internet magazines and newsletters: The Healers’ Journey; The Magic of Being out of England; Positive and Co-creative News; Sound of Heart; Universal Living Light; The Gathering Spot; The Light-workers; Blend of Loving Energies; The Shift Network; Ascension Central, and Holistic Fitness. She has written articles appearing in: Huffington Post; Spirit in the Smokies; The Network; Miracle Journeys; Inner-Worlds; Awareness Magazine. A Spiritual Synergist, ceremonialist, minister and high priestess, Peggy creates soulful rituals to celebrate the sacred: weddings, memorials and other services. Sacred sites in Arabia, England, Ireland, Egypt, Japan and St. Lucia are just a few of the blessed places around the world where she has conducted ceremonies for transformation and healing using the power of sound, the power of prayerful intentions and the holiness of water. She is the Seneschal for the Waters of the World fountain in the Courtyard of the Goddess in the Garden of the Beloved. (Water which has been gathered, collected, sent from all over the world seeds this fountain with the vibrations and healing energy of its source.) She is a seneschal (keeper) of the Andaras stones. Peggy is also the Seneschal for the Labyrinth in the Garden of the Beloved, a sacred space that dwells in a graceful wooded setting at her home in California. This labyrinth is available by appointment for individual or group walks and special occasions. For twenty-four years, she has hosted Miracles & Intentions, an open monthly support group for women. • Clairvoyance is the ability to see images and energy not visible to the human eyes. • A Spiritual Synergist is someone who unifies, integrates, weaves and blends diverse beliefs. in a different form, into another system. • A Seneschal is a keeper or a steward of sacred sites and sacred objects.